Screen shot from YouTube HD version. In the final car chase towards the end of the movie, the 3 cars turn in front of a VW and Porsche dealer in Long Beach. Research indicates it's Ricketts Motors, 999 Long Beach Blvd. Entire road is one way. A few screen shots from a YouTube HD version, showing the original group leaving the parking space in the beginning of the movie. Location is on California Highway 74 up from Palm Desert near Palm Springs. Driving the early '55 Karmann Cabrio is Mickey Rooney, with Buddy Hackett as passenger. Note the fender mirrors, whitewall-effect wheel beauty rings, 3rd brake light, egg tail lamps, and single chrome turn-down exhaust tip. I often wonder about converting two stock 34 PICT-3 to dual carbs on a type 1 engine. 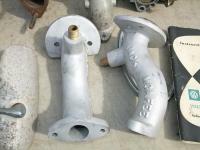 You can find good cores at swap meets for $10, with the main criteria that the throttle shaft does not have excess play. 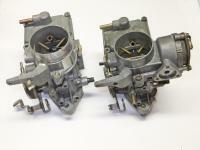 Most aftermarket single-throat dual carbs don't use chokes, so that the original carb becomes much more compact. I removed the choke plate and shaft, then sawed off the choke housing with a fine blade hacksaw. Filed off the remaining cast marks. 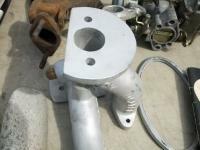 Will fill the choke shaft holes with gas tank kneading epoxy. To lap cylinder top surfaces flat, then lap the tops into cylinder head combustion chambers I made a tool based on a toilet bowl plunger. Inverted the rubber bowl, cut 3 wide "V" out so that the rubber contacts the cylinder walls with friction. Shortened the handle so that I could spin the tool between my palms. Also inserted a 1/4" stud so that I can drive the tool with a variable speed drill, which I use the most. Works very well. I first lap the cylinder on a flat glass mirror tile covered with 220 or 320 wet until I observe that the entire lip surface is uniformly smoothed. Then lap into the head using valve grinding compound. Sept. 2017 I picked up 2 cases and 3 pairs of heads which I had machined at Valley VWs/The VW Store in eastern PA. Both cases had original main bearing dimensions and did not need an align-bore. 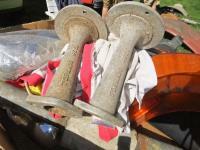 Both engines were long-blocks which were either given to me, or were low-cost purchases. -H5 case: cylinder spigots decked, 8mm case savers installed, oil galleys tapped for plugs for easy clean-out. 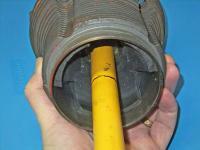 -1970 D case (dual-relief)- cylinder spigots opened for 90.5 cylinders, 8mm case savers. All heads are stock 35mm intake/32mm exhaust, and have unbroken exhaust studs. Rear cover of "VW Information" magazine, issued by VWAG for the worldwide dealer organization. Issue III 1960. Color is likely L241 Bamboo, for the 1957 model year. Sweden (Sverige) switched to right-hand traffic in 1967. Article from "VW Information" magazine, issued by VW Germany for the worldwide dealer organization. issue III 1960. Beautiful fall weekend day for a nice drive, even though the temperature stayed in the mid 50's. 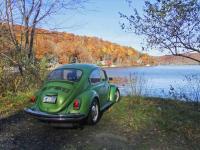 Our family has often targeted Lake Waramaug in northwestern CT for a scenic drive in the past 40 years, and I went there today in my '77. My guess is fall foliage color is about a week past peak. Car ran great for the 170 mi. round trip. Lime Rock Park race track was slightly less than 2 hours away. In '78 I drove there to watch one of the summer race sessions in my VW Dasher. The parking lot was always fun to walk through because most visitors were "car people" and there would be a big selection of modern imports or otherwise interesting vintage cars. I saw this modified 914 with a "sport roof" addition, and Western turbine-style rims. I wonder if the MA dealer plate was from Autodynamics, the dune buggy and Formula Vee builder out of Marblehead? I never saw another such conversion, and don't remember seeing it advertised in import magazines (e.g., "VW Greats"). 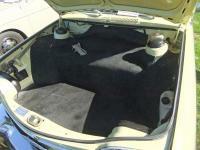 My '64 Ghia Cabrio had a heavily worn black vinyl original top when I bought the car in late '83. Some of the damage was the rear bottom edge had pulled away from the rear fastening bow, and the plastic rear window was also very cloudy and ripped. Luckily the front wood bow and the crank mechanism was in good shape and reused. I bought an NOS wood rear bow from VW which came out of the VW Atlantic parts warehouse in Lanham, MD 2 years before. 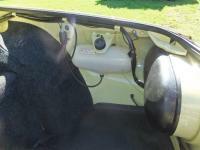 I had an automotive upholstery shop in Nyack, NY perform the top replacement. Good friend gave me an NOS '67 tan colored top which had a slightly wider rear window shape than the '64's. The center metal bow needed to be welded onto the left "S-bend" strut. New headliner installed as well. Shop did good work but closed in the mid '90's. Drove down to this huge VW event as spectator. Went up to top of the 1/4 mile drag strip bleachers to get some overall shots. 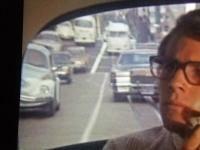 Early in the movie, Howard Bannister (Ryan O'Neal) and his fiance are riding in a taxi going to a hotel in San Francisco. Behind the taxi are two Beetles, a Bay Window and Splitty buses. Early in the movie, Judy Maxwell (Barbra Streisand) stops at a pizza store in San Francisco. A white notchback drives past behind her. A few minutes later she follows the delivery man across the street, oblivious to traffic. As a motorcycle wipes out avoiding her, there's a red with black roof Type 3 Ghia on the opposite curb. Hughie Hogg's Beetle in "Dukes of Hazzard"
In March 1997 a colleague and I were in Bavaria for a business trip. Over the weekend we visited the EFA Auto Museum in the village of Amerang, east of Munich. I was thrilled to see that a visitor drove a dark blue Super Beetle Cabriolet. Further luck was that the owner was leaving so I could speak with him a few minutes. Said this was a regularly offered conversion performed by Oettinger at their facility near Frankfurt. The heat exchanger was under the rear seat on the left side, opposite the battery. I don't remember where the coolant radiator was located. The engine conversion was very well done, with as many factory parts from various models, mostly the Vanagon (designated T3 in Europe). I was surprised at how well the longblock fit into the original engine space. Car had wide 5-spoke ATS alloys. Small red light on lower left under bumper is a rear fog lamp. In March 1997 a colleague and I were in Bavaria for a business trip. Over the weekend we visited the EFA Auto Museum in the village of Amerang, east of Munich. I was thrilled to see that a visitor drove a dark blue Super Beetle Cabriolet. I could peek through the engine cooling vents and see there was no upright fan shroud on the engine, but could not identify what it was. Further luck was that the owner was leaving so I could speak with him a few minutes. Said this was a regularly offered conversion performed by Oettinger at their facility near Frankfurt. The heat exchanger was under the rear seat on the left side, opposite the battery. I don't remember where the coolant radiator was located. The engine conversion was very well done, with as many factory parts from various models, mostly the Vanagon (designated T3 in Europe). I was surprised at how well the longblock fit into the original engine space. Car had wide 5-spoke ATS alloys. Small red light on lower left under bumper is a rear fog lamp. Jack McAfee manifolds seen at the Connecticut VW Assoc. meet in Westbrook, CT 5/2017. Seller said they are NOS. Tornado manifolds have a very unusual carb mounting "platform" with the raised center for which I cannot imagine what kind of carbs would be utilized. Seen for sale at the All Aircooled Gathering, Flanders NJ 9/2018. 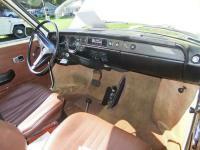 Incredible 1971 411 Sedan in original condition. Wonderful weather. Thanks to the Central Jersey VW Society for planning and running the event. Build tag at front trunk edge indicates 1971 calendar week 29 and weekday 3, which is July 21. On Rt 46 and intersection of Rt 10 there is a long-closed old diner, Tom's Diner. I parked my '77 Std. Beetle on my drive back from the 14th AirCooled Gathering a few miles west in Flanders NJ. 3rd generation family diner owner intends to restore it. 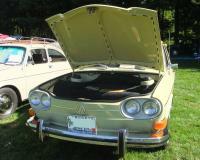 Incredible 1971 411 Sedan in original condition. Wonderful weather. Thanks to the Central Jersey VW Society for planning and running the event. Overall shots. Wonderful weather. Thanks to the Central Jersey VW Society for planning and running the event.